A sign on Australia's Great Ocean Road reminding foreign drivers to keep left. The driving side of a road is the side on which traffic flows. Each country says whether traffic will keep on the right-hand or left-hand side of the road. This is sometimes called the rule of the road. This basic rule makes traffic move easier. It also reduces the risk of head-on collisions. Today about 66.1% of the world's people live in countries who drive on the right-hand. 33.9% live in countries that drive on the left-hand. Do not confuse between left-hand drive (LHD) and to drive on the left-hand side of the road which is the right-hand drive (RHD). 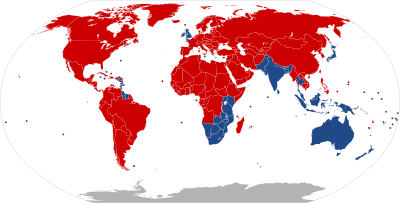 While most countries who drive on the left-hand are former British colonies, there are some that were not that still chose the left-hand side of the road, including Japan, Thailand, Nepal, Bhutan, Mozambique, Suriname, East Timor, and Indonesia. Today, only four European countries drive on the left-hand, the United Kingdom, Ireland, Malta, and Cyprus, all of which are islands. There are several countries where their territories that exist outside the mainland drive on a different side from the mainland. One well-known example is that all of China drives on the right-hand except for its Special Administrative Regions Hong Kong and Macau, which drive on the left-hand. Historically, before the creation of the automobile, people mostly rode on the left-hand side, since most people were right-handed and would whip their horses with their left hands. On top of that, warriors in battle could also use their right hand to hold and control their weapon. However, during the 1700s, it became common for farmers to pull their vehicles with teams of horses rather than one so that the driver could easily whip all the horses and so that the driver could see how close his|her wheels were to colliding to another wagon. In 1794, France passed the first right-hand driving laws, and this law would spread with Napolean's conquests. While territories and colonies of the former Austro-Hungarian Empire and the Portuguese Empire refused to change the direction of driving, most eventually chose to drive on the right-side, with the only exceptions being Mozambique, East Timor, and Macau. However, many former British territories and colonies refused to change their direction of driving, and still do so today. That being said, some exceptions do exist, with examples including Canada, Myanmar, Gibraltar, British Indian Ocean Territory, and a few countries in West Africa like Ghana, Nigeria, Sierra Leone, and the Gambia, all of which switched to left-hand driving. ↑ Draper, Geoff (1993). "Harmonised Headlamp Design for Worldwide Application". Motor Vehicle Lighting : 23–36Society of Automotive Engineers. ↑ Kincaid, Peter (December 1986). The Rule of the Road: An International Guide to History and Practice. Greenwood Press. ISBN 0-313-25249-1. ↑ Lucas, Brian (2005). "Which side of the road do they drive on?". Retrieved 2006-08-03. ↑ Dan Stone, Dan Stone (2013-05-31). "The Right (and Left) Stuff: Why Countries Drive on Different Sides of the Road". National Geographic Society (blogs). Retrieved 2017-06-27. ↑ John (2013-02-22). "Why Does Japan Drive On The Left Side of the Road?". Tofugu. Retrieved 2017-06-27. This page was last changed on 4 April 2019, at 14:32.